There are two ways to use the same social icons across all emails. 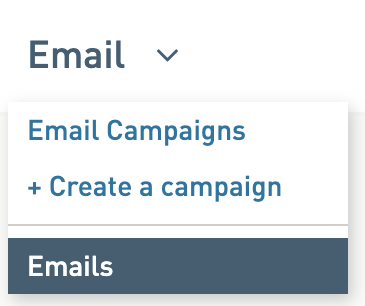 You can set up a master template with your social icons and base all subsequent emails on that template or you can copy and paste a little HTML. We'll talk about how you can use your own social media icons. How can I use my own social media icons? Option 1: Copy existing emails that already have social icons set up. Option 2: Copy the HTML for your social icons block and use it in a new email. In WordFly's Modern Editor there is an entire social icon library you can access directly in the editor. You can insert any of the available social icons directly into any text, preheader, footer or social links block. It is not possible to upload your own social icons to this library but you can learn how to upload your own social icons into any text, preheader, footer or social links block. 2. Click on any text, preheader, footer or social links block. 3. From the left side of the editor (the Edit Content Panel) place your cursor in the open content area. 4. Click on Add > Image. 5. Click on 'Add icon' above the src field. 6. This is the WordFly social icon library. Click the icon you would like to add to your block. 7. After clicking your icon, fill in the fields for alt (alt text) and href (redirect link), then click I'm done. This adds the selected social link to your block along with the alt text and link you assigned to it. Continue repeating the steps above until you have added all of the social icons you wish to add to your email design. Use your own social media icons by uploading the icons into a new media folder in WordFly, copying the image links, and then inserting these links into your text or social links blocks. Review the links posts below to learn how to do this! Learn how to upload your social icons into a media folder. Learn how to insert social icons into your email. Once you have your email design solidified you can continue to use the same social icons in each new email template you create for your email Campaign sends. There are two main options for continuing to keep the same social icons in new templates. 2. Click on the email name you would like to copy. 3. Select Duplicate. 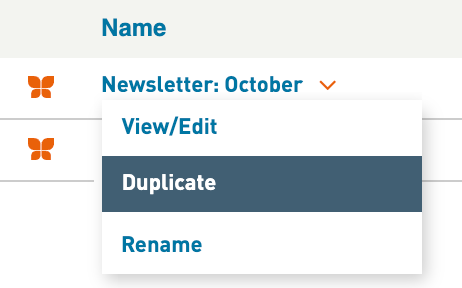 Give the duplicate a new unique name or keep the name with (copy) at the end. Duplicating your email will retain all the content within the email, including your social icons and links! 4. Continue editing your duplicated copy of the email. Click the name of the email again and select View/Edit. 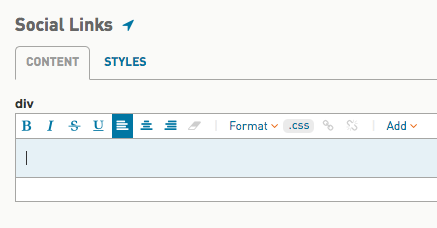 In WordFly's Modern Editor you can go into the HTML any text, preheader, footer and social links block. Once you access the HTML you can copy it and then transfer that code into any other email template you might be working on. Follow these steps to copy the HTML of one block and transfer it to another one. 2. 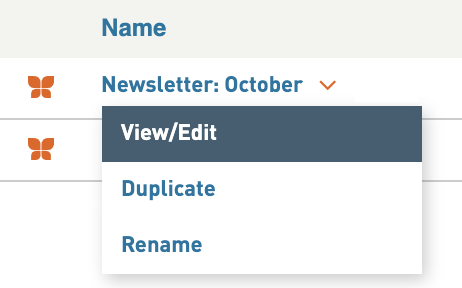 Click on the name of your email and select View/Edit. 3. Select “Edit in WordFly”. 4. Click on the social links block. 5. Click on the <html> button. 6. Copy all of the HTML from the window. Click I'm done. 8. Open a new email without your social icons and links. 9. Click on the social links block or any text block you would like to use. 10. Click on the <html> option. 11. Paste in your social links HTML.